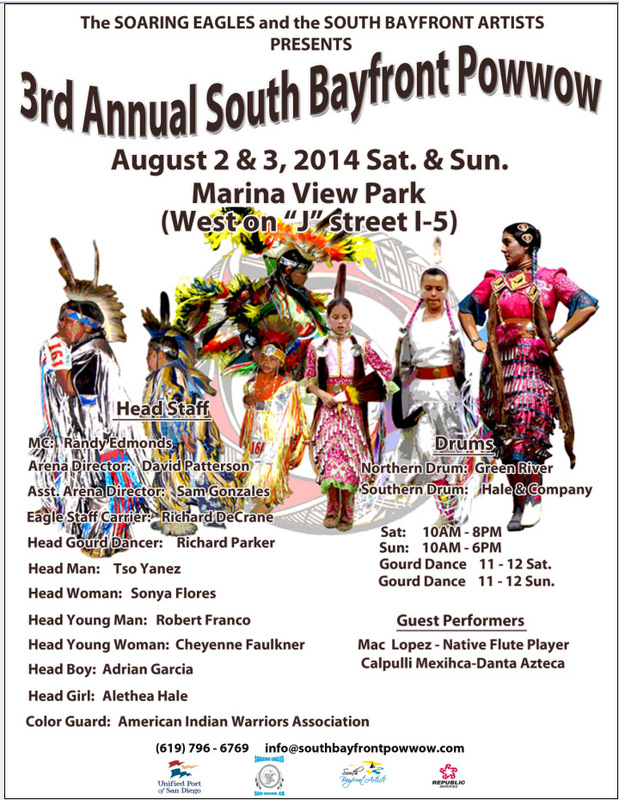 The August 2 & 3, 2014 South Bay front Artists, Soaring Eagle two day 3rd annual Native American pow wow will be a free event and celebration of life. This convenient Marina location is excellent. The weather should be gorgeous! We thank our event title sponsor, the Port District of San Diego. 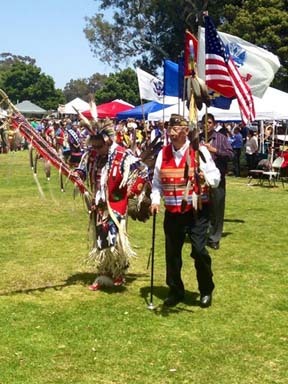 These opportunities to share our pride of our Soaring Eagles dancers in traditional tribal culture and participation in public American Indian gatherings allow us to endure and remain a vital cultural, political, social, and moral presence in the San Diego region. Summer gatherings are traditional opportunities to visit with relatives and old friends. Even in urban settings many of the hospitality and generosity is a part of the recognition and public presentations that come into the dance circle. This year we will honor Mr. Wilbur Solomon, Omaha tribal member from Macy, Nebraska. Wilbur is a retired Navy Veteran from the Korean War era. He has been instrumental in organizing and participating with the Pacific Coast Indian Club and dance troupe. They have participated from the early 1960s on the Barona's Band of tribal land. He is also one of the earliest members of the Golden State Gourd Society and can still be seen when those songs call the dancers to participate. He has lived in San Diego for over 65 years and has many of his family still residing here too. We are fortunate to see self esteem and confidence demonstrated by all our friends and relatives at these Pow wow dance and song experiences. Our parents and volunteers are truly blessed to have our future and next generation children eager to have a good time doing Indian things. Finally, the Tonkawa Elders club and the American Warriors Association, AIWA, are honored to be invited to attend and participate on many levels at this event.